This Sunday 29th March, our friends at WWE Parties Ireland present their fourth-annual WrestleMania 31 Party from Woolshed Baa & Grill on Parnell St, Dublin. The event is expected to be a sellout with the full WrestleMania pay-per view airing live on Woolshed's 3x big screens and 16x plasmas around the venue, and pre-show entertainment from 9pm with WWE Parties' annual 'Hall of Fame ceremony', a classic WWE-themes DJ set and the top 10 WrestleMania matches of all-time as chosen by the WWE Parties' faithful. 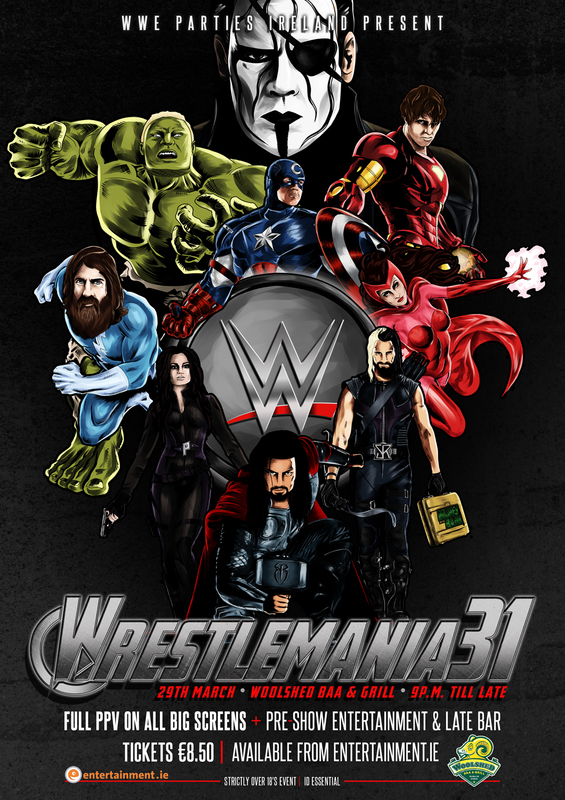 The WrestleMania 31 card is set to feature Brock Lesnar defend his WWE World Championship against Roman Reigns, Sting make his official WWE debut against Triple H, The Undertaker return to face Bray Wyatt, a multi-man ladder match for the Intercontinental Championship and much more. For those who've never attended a WWE Parties Ireland event, you can check out how the company came to be and what you can expect from the night in their recently released ad for the night below. Now for the fun part: you can win 2x tickets to the night by partaking in our contest below. To win, all you have to do is answer the below question on Twitter, then add the hashtag '#WoolshedMania4' at the end of your answer. Make sure you get entries in before this Friday 6th March. What was the main event of the first-ever WrestleMania? In the meantime, you can get full event info HERE, while you can buy tickets online HERE.